Working next door to “the salad people” can be interesting, like when they bring a new variety of melon over for us to try, but also very daunting. When we first started speaking about my working with them, all I could think was… my salads are not that exciting. What could I even contribute? Growing up with a typical Colombian mother meant our diet was lots of meat, potatoes, and rice, and our salads were lettuce, tomato, and cucumber, always. I don’t think I had even tried bell peppers (capsicums) until I moved over to Australia! Once I was living on my own, I started developing my own usual dinners, usually just simple chicken and salad combos, sticking with my tried and true lettuce/tomato/cucumber. But then once I had a kid, I really had to start evaluating what I was eating every meal. Does the meal have a few serves of veggies and a good variety of them? Lean protein? Whole grains? On top of that, after long struggles of lunch boxes coming home uneaten, I started sticking to a cheese and vegemite sandwich (gross! ), fruit, a hunk of cucumber, and some crackers, since that would actually get eaten. So, dinnertime servings of veg became very important to my kid’s diet. Today, I’m starting with the first salad that really won my heart; one of the salads that even impressed my staunchly “salad is a side, not a meal” Colombian mother. This is a simple one since it’s my go-to for when I don’t really feel like cooking, but I want something healthy, delicious, and filling. I’m pairing it with another simple salad; similar ingredients so that bag of baby spinach can work for both, and similar dressing so you don’t feel too nervous to give it a try. 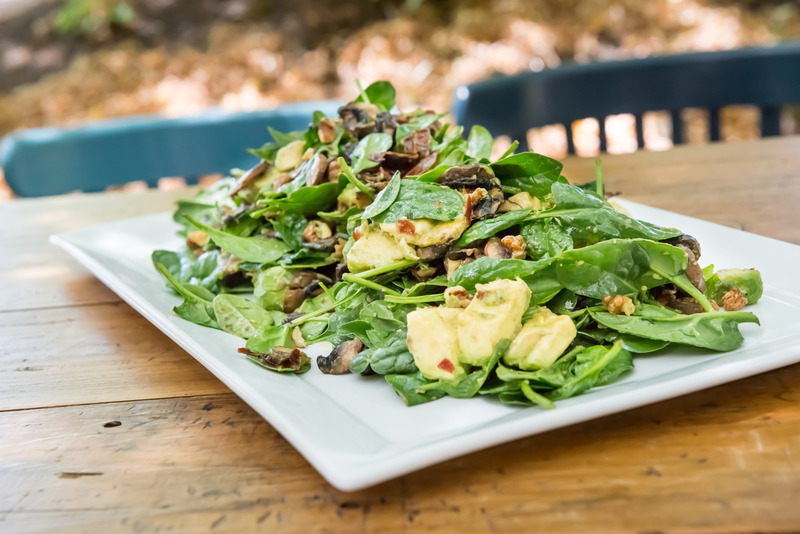 The first salad, my most favorite out of all the ones I have discovered, is this quick and easy mushroom, spinach, and pancetta salad with walnuts and avocado. In this one, for example, I wasn’t able to find pancetta in the supermarket so I subbed it out with prosciutto – same difference. Also, dressing the mushrooms right in the pan with olive oil and lemon saves me from having to whip up a separate dressing, which keeps it nice and simple for those weeknights where you just can’t be bothered. When I’m tempted to just eat cereal for dinner, I just have to remind myself how easy this salad is (seriously, ten minutes! ), how filling (and filled with great stuff! ), and how great my mind and body will feel after this meal. The second salad is a great one for those days when you might have an activity for your kids (or a gym session, dentist appointment, etc for yourself) in the early evening. This marinated mushroom, haloumi, and sun-dried tomato salad has similar ingredients (spinach, mushrooms) and a similar dressing (lemon, olive oil) so you can use up that whole bag of spinach this week and not feel guilty every time you open your veggie drawer (is that just me?) – but the spices (chili, garlic, and oregano) keep the flavors a bit different. I like to whip up the marinade and leave everything marinating in the fridge, and then when I get home after the activity/appointment I can just quickly cook up the mushrooms and haloumi and bam, dinner done. I love doing this one too because a cool salad with crusty bread and olive oil is one of my favorite ways to eat. Growing up with meat and potatoes every meal was a hard habit to break, and now that I’m in charge of dinners I like to show my kid that meals can have a lot more variety in terms of style and ingredients (we love tapas!). From the author: I love salads, but being a working single parent I'm often short on time. 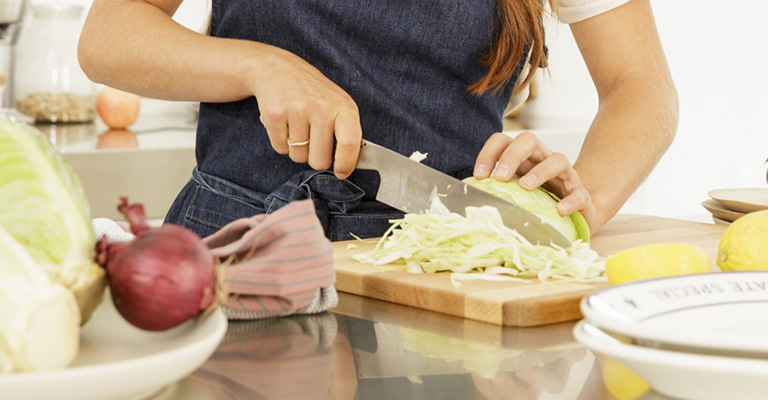 Still, it's important to me to eat well, and to pass on my love of veggies with my (not so) little one, and now that I've got a few tricks up my sleeve I'd love to share what has helped me do that. I'll be sharing more tips through a "Quick and easy salads kids will love" series, which you can see at my profile, and feel free to chime in with some of your salad hacks!